Louisa McElwain, Badlands, Dream Time, Oil On Canvas, 12" x 16"
Louisa McElwain serves almond tea in a red-and-white polka-dot tea set, with raisin and chocolate chip cookies baked by her two young daughters. Assorted animal sounds—the sporadic shrieking of cockateels, the soft scuffling of a lop-eared rabbit across the smooth floor, and the chattering of a guinea pig named Albert (as in Einstein)—fill the room, along with warm sunshine filtering through flowers and tomato plants on the south windowsill. 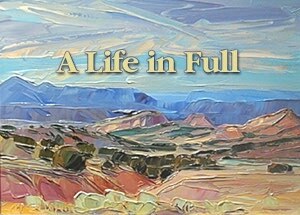 McElwain's life, like her art, is about expressing fullness—eyes wide open, all senses engaged. It's the way she paints. With the back of her Toyota pickup or van set up as an outdoor studio, she matches the spirited, impetuous northern New Mexico sky and land with her own energetic style. All her paintings are done en plein air, even 9-foot-wide canvases that she clamps onto boards on the side of her van to make an enormous, wind-resistant easel. 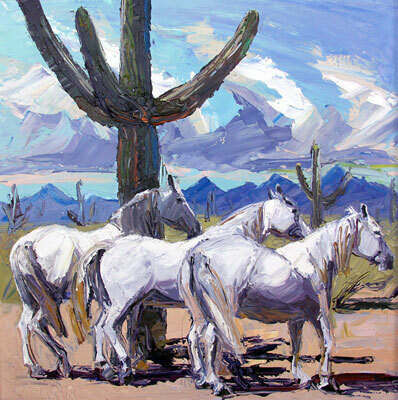 With nearly 15 years of painting outdoors in New Mexico behind her, McElwain has developed the technical skill, familiarity with patterns of weather and light, and ever-deepening connection with the land that allows her to plunge into the creative experience. The resulting painting leaves the viewer with a unique understanding of what it's like when sky, clouds, wind, arroyos, and mountains fill up the senses. "It's like dancing to the tempo of the evolving day," she says, describing the very physical experience of painting outdoors. "A painting is like frozen choreography, like a ballet that you can see all in one moment. It's made of marks that are gestures made through time to the rhythms of nature. Every day has a different kind of rhythm. On some days the wind is a big factor, on others it's insects or heat or cold." 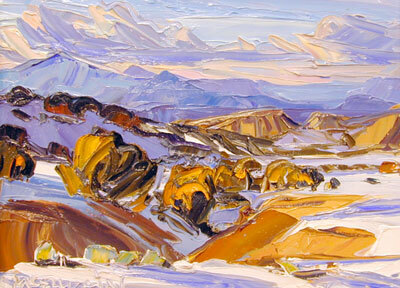 Louisa McElwain, Poca Sombra, Pascua, Oil on Canvas, 30" x 30"
For years McElwain has been known for using only palette knives to apply paint, a technique that allows her to work swiftly and precisely. It was a need for haste that first gave her the idea of trading in brushes for knives. On the shore of the Chesapeake Bay many years ago, the artist was in the middle of a painting when she realized the sun was dropping quickly. She scooped some paint onto a palette knife and spread it on the canvas. She was delighted with the lushness of color and texture, not to mention the ability to capture the scene before the light was gone. 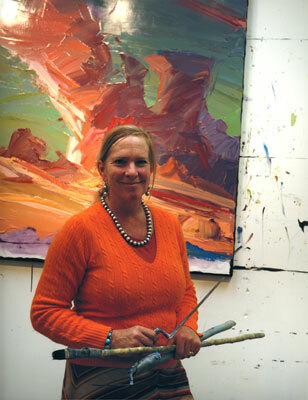 Lately, McElwain has taken to applying paint with the flat edge of the knife as well as the point, producing less of the cake-frosting effect characteristic of her earlier work. At the same time her growing affinity for the land in general, and certain places in particular, comes through in her work as an authentic and immediate expression of wonder. 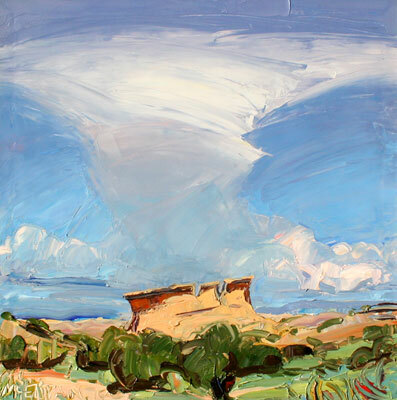 Louisa McElwain, Hoodoos and High Clouds, Oil on Canvas, 30" x 30"
"When I first came to New Mexico I was looking at the landscape in a very objective way," she says. 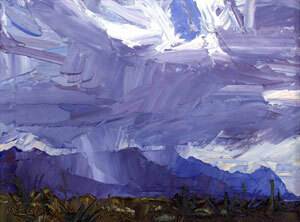 "I can remember looking at some of those cloud formations and thinking, 'I can't go out there and paint that.' It was not a relationship I was ready for." But it was a relationship she was destined to develop—the seeds of which had been well planted during her childhood on a New Hampshire farm. As a girl she spent many hours walking in the woods with her father, a man she describes as an "educated Yankee farmer, sort of a radical thinker and philosopher." McElwain's mother, the artist concedes with a wry smile, "was interested in me turning out to be a slender, perky, popular tennis player." But she was also a woman with a deep love of growing things and a passion for animal rights, both traits that she passed on to her daughter. Louisa McElwain, Arroyo de la Barrancos, Oil on Canvas, 12" x 16"
McElwain also has a deep appreciation of poetry. "I experience an affinity with poets," she says, turning the pages of a thick paperback with yellowing paper edges, an anthology of American verse. She stops at the poetry of Walt Whitman. "The way he uses words to stretch their meaning—Whitman was just so full. He was so open to life." For the artist, of course, poetry's equivalent is paint. "Paint is a sensuous medium and has expressive potential that is boundless," McElwain says. "And for me, it's about giving myself permission to explore the sensuous nature of paint in spite of that little, niggling art-school voice that says, 'She's being too seductive with the surface!' I shut that out; I've muted that voice." Louisa McElwain, Chamisas & Clouds, Oil on Canvas, 16" x 20"
She does rely on things she learned in school—she attended several prestigious art schools in Pennsylvania and Massachusetts—and has been especially influenced by Josef AlbersÔ theories on color and light. She also has a solid foundation in drawing, thanks in particular to time spent intensively studying classical figure drawing with an 82-year-old Italian maestra in Florence. After leaving the East Coast—heading with her dog, paints, and pickup truck to New Mexico instead of New York—she discovered that her own style erases boundaries. She calls it "post-modern romanticism." Romanticism, as she sees it, encompasses her love for animals, Brahms, thriving flower and vegetable gardens, poetry, and untamed nature, as well as the sensuous smell and texture of oil paints. The post-modern tag means that McElwain has rejected the rules of formal modernist aesthetics. She celebrates surface texture and paint for its own sake, as did the abstract expressionists. She also draws the viewer's eye into the depth and illusion of a landscape through the filter of her own passion and perceptions. Louisa McElwain, August Arroyo, Oil on Canvas, 28" x 68"
"I'm very fortunate to have been exposed to these ideas, and I'm devoted to synthesizing these things in a new way—to bring them in concert with each other," she says. "I experience life in a very holistic way, and I want my paintings to be very whole." Lately this holism has taken on a literal twist. Out in the wind on summer days, insects and dust sometimes end up stuck in thick, wet paint on a canvas. McElwain used to pick them out and sometimes still does when they are distracting to the image. Recently, though, the bugs have led her to ponder the simultaneous existence of two very different realities that make up her experience as she paints. One is the gloriously sweeping vista before her as she stands on a bluff, palette knife in hand. The other reality is tactile and immediate. It is soft soil, grass, sage, and bugsÊas well as a reminder of humanity in the form of broken glass or a crushed beer can near her feet. Louisa McElwain, The Tumacacori from Palo Alto, Oil on Canvas, 15" x 30"
To acknowledge these divergent elements, the artist has begun incorporating bits of the physical world into her art. If the corner of a canvas picks up gravel or bits of grass when it touches the ground, she may leave them there. Sometimes she even deliberately sticks tiny pieces of fragmented bone or broken glass on a painting. "I don't see putting physical things on the canvas as a judgment against human desecration of nature; it's more like a blessing, like Navajo weavers used to do when they wove tiny bits of horse hair, bone, or pottery into a blanket as a blessing to the person who was to receive it." McElwain has also changed her thinking about finding new landscapes. For a while she constantly scouted out different spots, spending hours roaming the back roads. Then she realized the weather, clouds, shadows, and light offer infinite variety themselves. "It's sort of like going out to meet a friend or a mother or a lover," she says of her favorite places. "It's familiar, but it's always different. I remember I had a fear once, maybe 10 years ago, when I wondered if I could keep this up, if I could keep doing these landscapes over and over again. But life just keeps renewing the questions and the longing to be open to new things, and it's endlessly stimulating. "I transcended the fear of being repetitious by realizing that never will it be the same twice." Gussie Fauntleroy wrote about Mallory Lake in the January issue. 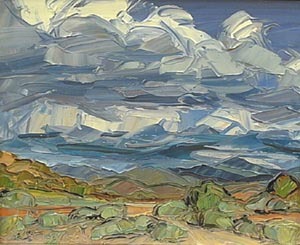 Louisa McElwain, Santa Rita's Rain, Oil on Canvas, 18" x 24"